Consumerism is a relatively recent development, but one that has had a profound impact on popular culture and our sense of personal identity and well-being. Does more stuff make us happier? Maybe, to a point, but research suggests that material wealth has its limits. A survey  conducted for the Center for a New American Dream in 2014 confirmed that the key to our happiness lies beyond simple materialism. While meeting basic needs is essential, other lifestyle components are just as important, including having personal freedom, achieving one’s potential, having enough free time and being in harmony with nature. Achieving affluence? Not so much. These findings suggest a value set that is diverging from the consumer culture that exists today, so why are we so entrenched as consumers? The dominance of consumerism is a relatively recent development, but one that has had a profound impact on popular culture and our sense of personal identity and well-being. The Centre for the Understanding of Sustainable Prosperity (CUSP) is exploring what prosperity can mean in a world of environmental, social and economic limits. The premise: "a prosperous society is concerned not only with income and financial wealth, but also with the health and wellbeing of its citizens, with their access to good quality education, and with their prospects for decent and rewarding work. Ultimately, prosperity must offer society a credible and inclusive vision of social progress." 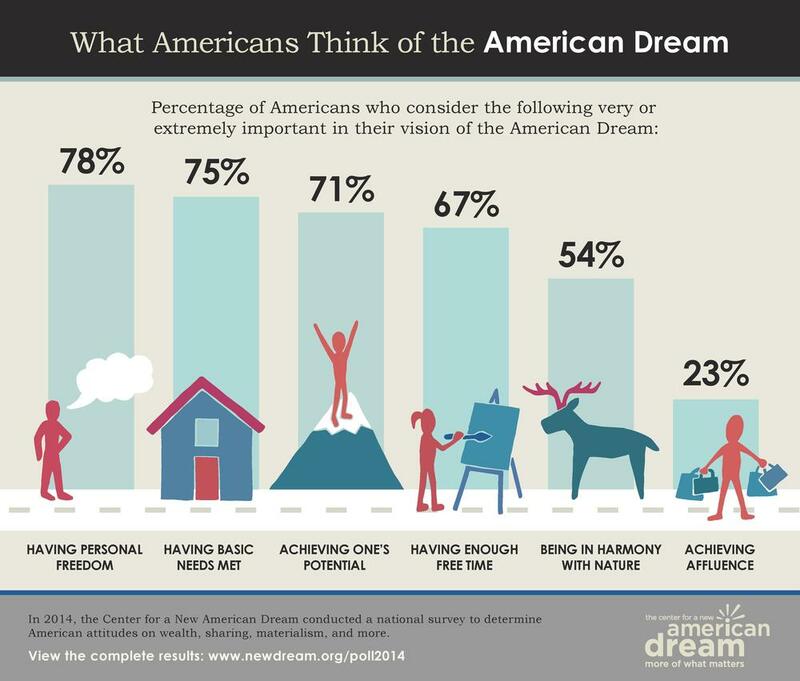 New American Dream Poll. Center for a New American Dream, 2014.